The site of the abbey of Villers-la-Ville is crossed by a national road which divides it and removes all coherence and unity. 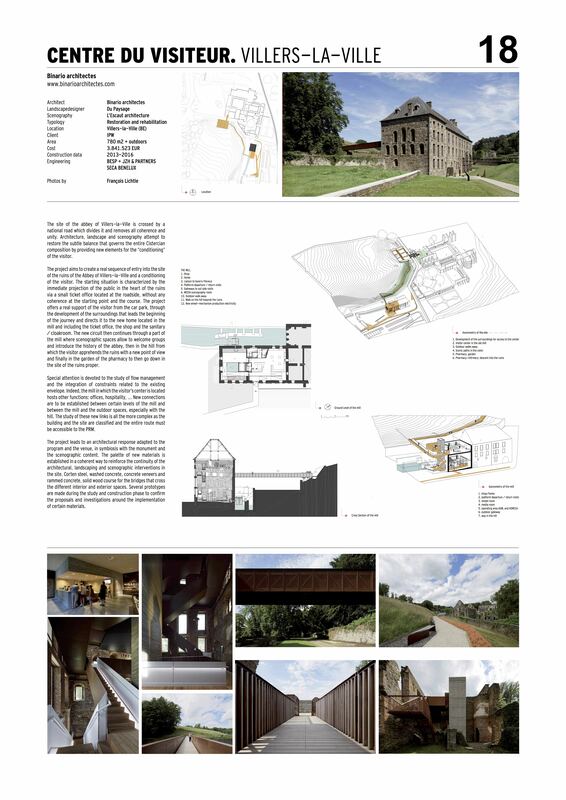 Architecture, landscape and scenography attempt to restore the subtle balance that governs the entire Cistercian composition by providing new elements for the “conditioning” of the visitor. The project aims to create a real sequence of entry into the site of the ruins of the Abbey of Villers-la-Ville and a conditioning of the visitor. The starting situation is characterized by the immediate projection of the public in the heart of the ruins via a small ticket office located at the roadside, without any coherence at the starting point and the course. The project offers a real support of the visitor from the car park, through the development of the surroundings that leads the beginning of the journey and directs it to the new home located in the mill and including the ticket office, the shop and the sanitary/ cloakroom. The new circuit then continues through a part of the mill where scenographic spaces allow to welcome groups and introduce the history of the abbey, then in the hill from which the visitor apprehends the ruins with a new point of view and finally in the garden of the pharmacy to then go down in the site of the ruins proper. Special attention is devoted to the study of flow management and the integration of constraints related to the existing envelope. Indeed, the mill in which the visitor’s center is located hosts other functions: offices, hospitality, … New connections are to be established between certain levels of the mill and between the mill and the outdoor spaces, especially with the hill. The study of these new links is all the more complex as the building and the site are classified and the entire route must be accessible to the PRM. The project leads to an architectural response adapted to the program and the venue, in symbiosis with the monument and the scenographic content. The palette of new materials is established in a coherent way to reinforce the continuity of the architectural, landscaping and scenographic interventions in the site. Corten steel, washed concrete, concrete veneers and rammed concrete, solid wood course for the bridges that cross the different interior and exterior spaces. Several prototypes are made during the study and construction phase to confirm the proposals and investigations around the implementation of certain materials.